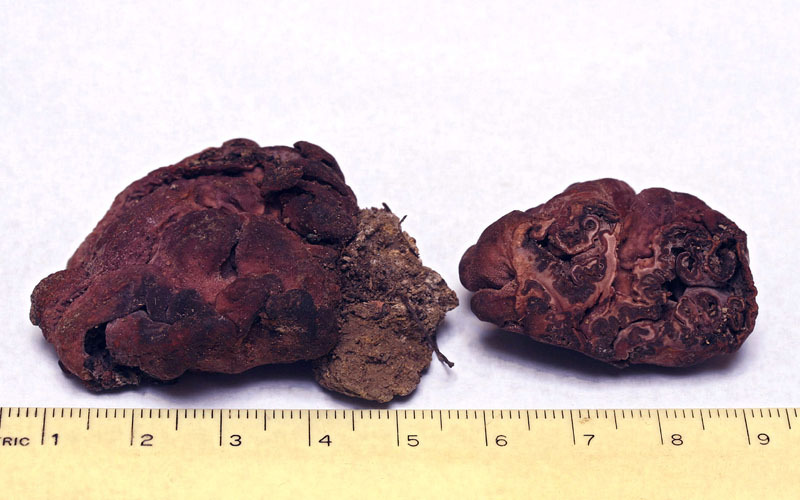 Ascocarp compressed-globose, 2-5 (9) cm broad, hypogeous to partially emergent, irregularly folded, cerebriform in aspect, with occasional openings to the interior; surface magenta-brown with sparse hairs; interior labyrinthoid, formed of invaginated surface folds, interspersed with narrow channels; subhymenial tissue colored like the exterior or paler; hymenium dark magenta-brown, finely pubescent; odor and taste not distinctive. Spores 11-15 x 9-10.5 µ, ellipsoid, finely warted, eguttulate, mostly uniserate, inoperculate; asci bluing in Meltzer's reagent. Solitary or in small groups, hypogeous to partially epigeous, under live oak (Quercus agrifolia), possibly with Monterey pine (Pinus radiata); known from coastal forests; fruiting from mid-winter to spring; uncommon, rarely collected due to hypogeous habit. This Ascomycete "truffle," would seem misplaced in Peziza, a genus of mostly epigeous cup fungi. Despite the morphological incongruity, a relationship is indicated by the presence of asci which blue in Meltzer's reagent, a feature of Peziza and the family Pezizaceae, as well as molecular studies. Macroscopically, the cerebriform shape of Peziza ellipsospora resembles a number of hypogeous Ascomycetes. Its magenta-brown exterior, however, is unusual. Most Ascomycete "truffles," vary in color from cream, brown to nearly black. Microscopic characters that help define the species include slightly warted, ellipsoid, eguttulate spores, and as noted above, the asci stain blue in Meltzer's reagent. California's hypogeous Ascomycete mycota is diverse. It includes species of Balsmia, Barssii, Choiromyces, Elaphomyces, Genea, Genebea, Geopora, Hyndotrya, Leucangium, and Tuber. Of these, Geopora cooperi, a pine-dwelling species, is one of the more commonly encountered and should be compared with Peziza ellipsospora. Similar in shape, it differs in possessing a brown, distinctly fuzzy surface, while microscopically its asci are inamyloid, with spores that are smooth and guttulate. Gilkey, H.M. (1954). Tuberales. N. Amer. Fl. Ser. II 1: 1-36. Trappe, J.M. (1979). The orders, families, and genera of hypogeous Ascomycotina (truffles and their relatives). Mycotaxon 9(1): 297-340.